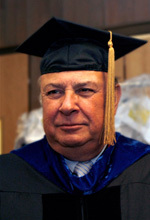 Harry J. Pappas, the Modesto native and son of Greek immigrants who has successfully developed an array of television and radio stations all over the country, will receive an Honorary Degree of the Doctor of Humane Letters at the May 31 California State University, Stanislaus commencement ceremony. The Saturday program starts at 8 a.m. in the University Amphitheatre. CSU Stanislaus President Hamid Shirvani will present the doctorate to Pappas, Chairman and Chief Executive Officer of Pappas Telecasting Companies, the largest privately held commercial television group in the United States. "California State University, Stanislaus is honored to award Harry Pappas this well-deserved recognition as a shining example of a successful Central Valley business entrepreneur," President Shirvani said. "In addition to his tremendous achievements in the field of television and radio, Mr. Pappas has devoted himself to philanthropic causes as one of the outstanding leaders from Stanislaus County." Pappas, who was a keynote speaker at last year's CSU Stanislaus Commencement, has expanded his company over the years to include 31 stations in 24 "Designated Market Areas" that he either owns or operates, including market-leading FOX network stations led by the first Pappas Telecasting affiliate established in Fresno. Pappas stations serve more than 16 percent of all U.S. television households and reach nearly 40 percent of the country's Hispanic households. Pappas also owns two radio stations. His company's most recent venture is CommunityCorrespondent.com, the first Web site of its kind for viewing on the Internet as well as for inclusion on TV newscasts. Pappas has served on the Fox Network Board of Governors and completed three terms as a member of the Board of Directors of the National Association of Broadcasters. He is a past member of the Board of the Association of Independent Television Stations of America and the Board of Directors of the Television Bureau of Advertising. Pappas has testified as an expert witness before Congressional committees and Federal Communications Commission hearings on broadcast industry issues. Pappas has been the recipient of numerous awards and honors, including induction into Broadcasting & Cable's Hall of Fame, the highest honor in the industry. He and his wife, Stella, have established two foundations to help the Greek Orthodox Church, and they support a number of civic organizations and causes.